Colored markers, drawing paper, my Bible and my TEA CUPP…what am I up to today? Doodle TEA! Today I share with you a book that has blessed my prayer time. Recently I read “Praying in Color” by Sybil MacBeth. Just as My TEA CUPP Prayers offer you a new flavor of prayer, MacBeth gives us a refreshing splash of color as she shares her prayer method with the world. And I love it! Just as I set aside time and space for My Tea Cupp Prayers, MacBeth prepares a spot for her “Praying in Color.” She collects her drawing paper and markers and invites the Holy Spirit to join her. I thought I would try out MacBeth’s prayer method along with My TEA CUPP Prayers one day, and found it to be an inspiring change of pace. 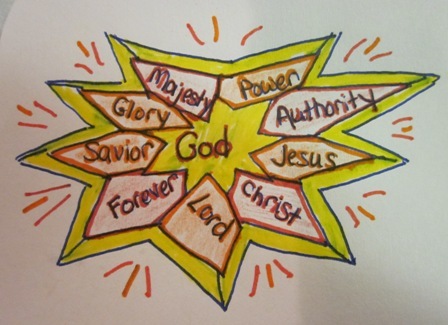 So in my prayer journal, in a sunburst doodle, I wrote God’s attributes from this verse (glory, majesty, power, etc.) as rays coming out from a center of EXALT. I pondered His glory as I colored in the sunburst, praying for God to be glorified that day. The perfect verse for me, since I’m so strong on prayer, but continue to worry. 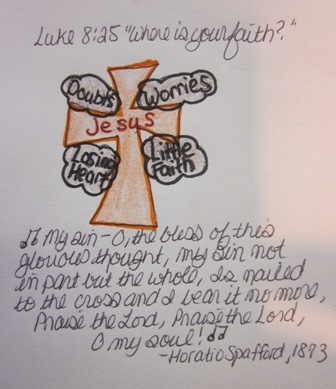 I drew a cross and “nailed” my sins to it with blob words like “doubts,” “worries,” “losing heart,” etc. I asked Jesus to wash it all away and make me new and full of His Holy Spirit. I drew my five-finger plate, and each thing God calls me to do on a finger. In the palm I drew a big heart, asking God to help me do each activity with love. Such a visual display of my prayers, were images I could carry with me throughout the day. I drew a big cross for Jesus, and wrote the names of all my family around it, that no one could separate us. The next day I had even more fun praying and doodling, writing my family members inside hearts, with their prayer needs around the hearts. For those in need of jobs and homes, I drew a house and wrote all their names inside. 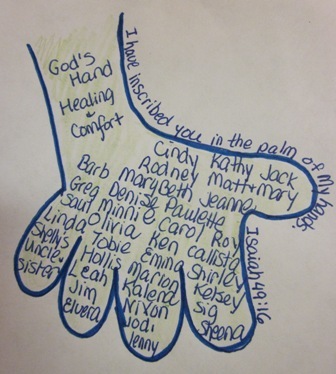 For those in need of healing and comfort, I drew a big hand labeled “God” and wrote all their names in the palm of His hand. And when the prayer requests came by email that day from our church, instead of being overwhelmed by the half-dozen emails, I doodled-prayed their names. I thank the Lord for Sybil Macbeth and her “Praying in Color” book. I hope you will check it out yourself and be blessed as she draws you into her doodle prayers. Get your markers ready when you join Jesus for your next TEA CUPP time! This entry was posted in My Recommended Books List and tagged christian prayer, Doodle prayers, prayer, Praying in Color, Sybil MacBeth by Jennifer Grace. Bookmark the permalink.